Melanie Gaynor, of Beauty Elements in Greenlane, entered beauty therapy on a whim. 25 years later, she is still going strong and has become a sought-after holistic skincare therapist with a focus on skin nutrition and helping women to relax and slow down. 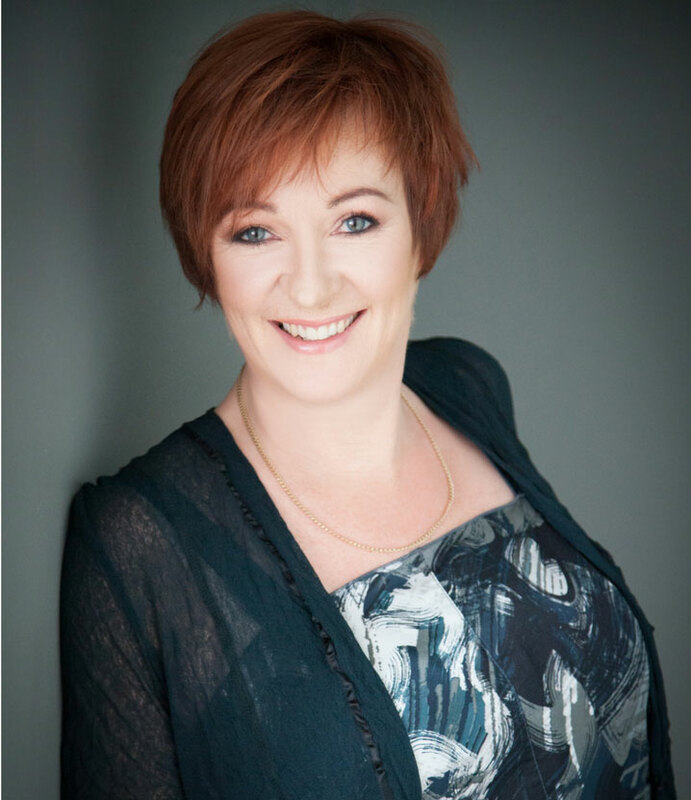 Melanie loves using the Bestow Beauty range to support her clients’ skin from within and is a Bestow Beauty mentor for therapists who are just beginning their journey of working holistically with skin. Melanie, what drew you to a career in beauty therapy career? As a teenager, I returned from an exchange programme in America, planning to complete a pre-university foundation course. The day after arriving home, I impulsively rang the beauty college. Someone had just dropped out, I went in for an interview and two days later I left home to start a course in a subject I knew absolutely nothing about. Two years later, I emerged a proud, fresh-faced beauty therapist and now I’ve been a beauty therapist longer than I haven’t! Tell me about your personal journey to discovering a holistic approach to skincare. When I graduated, the only salons I had experienced were the one at college and the one at the health farm where I completed my week-long work experience. At the health farm (as they were called back then), my love of aromatherapy was born. I spent the week finding every possible excuse to go into the essential oil room. It was heaven: a cool, dark room with the mingled scents of rows upon rows of gorgeous essential oils. That was my first little prod towards the love of natural in my professional life, but I think that passion was always there. Even in primary school, I brewed chamomile to rinse my hair, made perfume from rose petals and mixed up natural face masks from yoghurt and honey. My favourite shop was the health food shop with its weird and wonderful selection of dried herbs. Where does this interest in wellness comes from? I grew up aware that the food we eat affects us. My Dad used to tell me I’d grow hairs on my chest if I ate all my cabbage! I knew that eating carrots would help me see in the dark. I figured out ginger helped digestion and lemon with honey soothed a cold. Looking back, I’ve never been ‘mainstream’ in my beauty philosophy, but it’s only now that I truly have the confidence to step out from the crowd and follow my own beliefs. My commitment to holistic beauty therapy is more of a reawakening and rediscovery. Did you have any moments of disillusionment with the beauty industry prior to this reawakening? I have to admit to being side-tracked for several years by the promises and impressive claims of the wider beauty industry. I arrived in New Zealand in 1996 and it was full-swing glycolics. Salons offered harsh chemical peels and I would see skin shed like a snake. It didn’t make sense to me at all. People were praising it for eliminating pigmentation, but all I could see was how it was leaving the skin vulnerable. Having come from a background of European facials, which focused on nourishment and relaxation, all this peel business was a big change. It was like the Emperor’s new clothing: everybody else was saying how wonderful it all was, but it just didn’t make sense to me. What led you back to holistic beauty? I kept looking around and thinking, ‘if all these wonder products are doing what they claim to do, why am I still seeing so many skin issues’? When I met Janine Tait at a Beauty Tech Conference I was relieved to discover I wasn’t the only one who thought microdermabrasion wasn’t the answer to everything. Since that day I’ve come full circle back to my beauty roots. I am convinced that nature has the answers and topical care is only part of the puzzle: mind, body and soul need attention too. What is the role of diet in holistic skincare? The food we eat affects every single cell in the body, so it follows that eating nutritious food will optimise all aspects of our health, including skin health. Diet is always discussed during my initial consultations; most people have a pretty good idea of what they ‘should’ be eating and drinking, but there’s always room for improvement. Clients respond best by making small, achievable changes that gradually become habit. Adding Bestow Beauty Oil to a morning smoothie for example, is a small but beneficial change that’s easy to make. I love that Bestow provides support in the form of real food supplements. 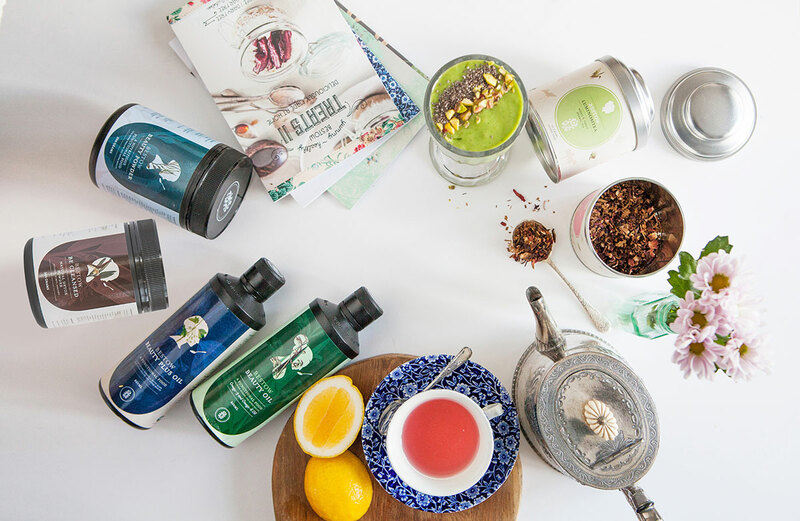 You can recognise the ingredients and it’s all about supporting normal, functional health, balance and wellbeing. How does Bestow Beauty support you professionally? Bestow University is a great revision tool and a reference resource to have for my clients and myself. I regularly introduce clients to the Bestow Beauty Oils and encourage them to add the oil to their daily routine. I have seen brilliant improvements for clients with rosacea, eczema and peri-oral dermatitis. The new Bestow Nourishing Facial Oil is also a great product. How have Bestow Beauty products helped you personally? I am very much a Bestow Woman: Bestow has been brilliant for supporting my skin through hormonal changes and I use the Bestow Beauty Oil daily and alternate between different Bestow powders. How does modern day life contribute to a culture of quick fixes in the beauty industry? Life is often busy and stressful these days and we put a lot of pressure on ourselves to be ever-achieving. Women in particular have so many roles to fulfil and they will often put themselves at the bottom of the list. Stress isn’t all bad but when its unrelenting it has a negative influence on physical and mental health. Rest and wellbeing aren’t priorities and there’s a lot to distract us from being in touch with our bodies: coffee, energy drinks, surfing the web and so on. Why is it important to you to create a peaceful atmosphere at your salon? A calm, peaceful place gives people a mini retreat, space to breathe, valuable time when nothing is being asked of them so they can just relax. I see so many tired, frazzled people that are wired and bombarded, over-scheduled and exhausted, and not taking care of themselves. I want clients to take time for self-care, to balance stress with relaxation and recharge. We need to embrace a balance between doing and being. How has your practice evolved to suit today’s busy client? When people come to me for facials I get to encourage this little moment of stillness when they take a deep breath and just surrender to relaxation.In the past year I’ve focused more on the massage aspect of facials. Learning new techniques that are from Ayurvedic and Tradition Chinese philosophies has given me a whole new dimension in my treatments. I really think about what I’m feeling in the skin and muscles of the face as I massage. The more I learn, the more I see how connected everything is, which is why the holistic approach is so vital. 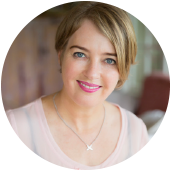 What part has Janine Tait, the founder of Bestow Beauty, played in your journey? Janine really shone a little light in a dusty corner of my mind. I’ve become more rounded and have grown more as a therapist through my experience with Bestow. Janine has the hands-on experience and is so talented at sharing her knowledge. What do you value about your connection with the Bestow community? 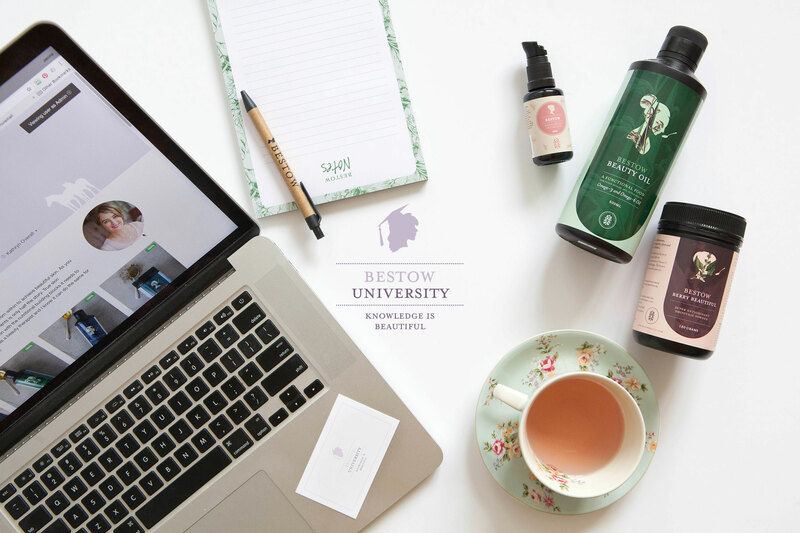 I feel blessed to have stumbled upon a group of kind-hearted kindred spirits who are so open to sharing their knowledge and forging the way forward for those of us in beauty therapy who are committed to a holistic practice. 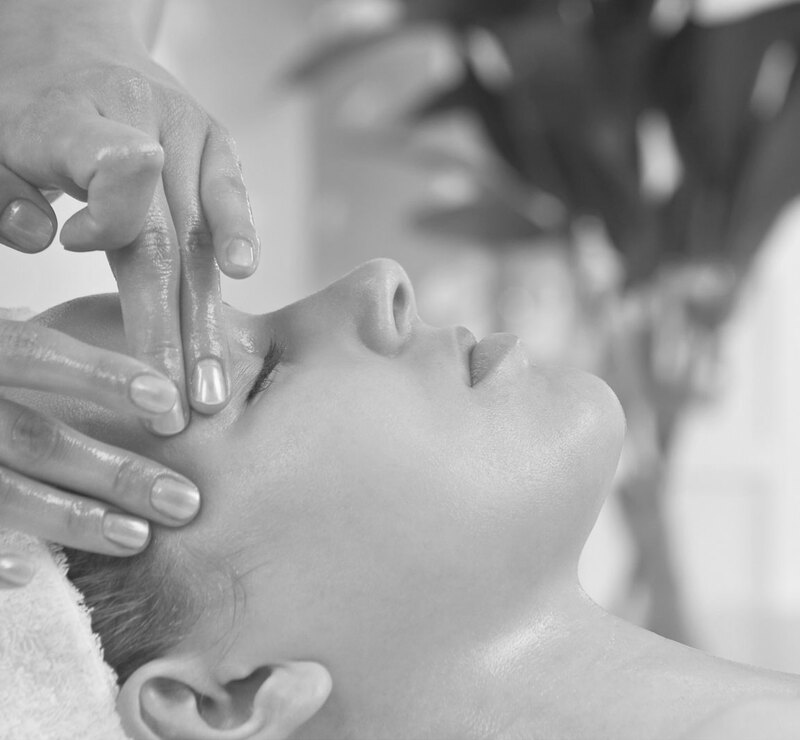 Do you have any advice for other beauty therapists wanting to embrace holistic beauty? Practice what you preach: use the products yourself so you can understand how powerful they are. Also, use resources like Bestow University to educate your clients. Don’t be discouraged if people don’t always follow your advice. This is a new approach for many people and they can be sceptical and take a while to make a change. Just keep learning as much as you can and gently pass this information on. Be patient, kind and consistent. Oh, and take photos – everyone forgets what their starting point really looked like! 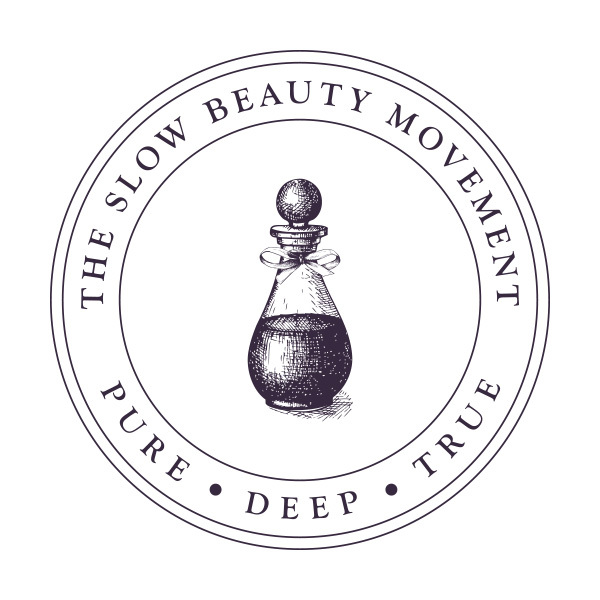 Slow Beauty is looking at the whole picture, taking the time to rebalance the health of the skin and any underlying issues rather than just throwing a quick band-aid fix at an issue. Slow Beauty always brings to mind the Slow Food Movement – both involve a philosophy of taking your time and enjoying the process.